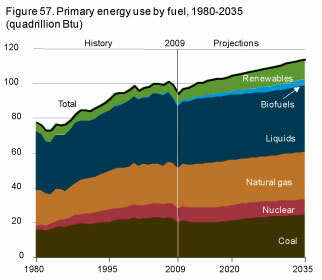 The US Energy Information Administration (EIA) is out with its final report on the Annual Energy Outlook for 2011. I recommend it to you as a good foundation for energy market and risk analysis. As is true in most simulation modeling exercises, EIA “assumes” current laws, regulations and policies in performing a fundamental analysis of expected energy markets for 25 years. This “reference case” becomes the baseline for further scenarios and studies of energy alternatives. For a document produced by the US Department of Energy what is surprising to me is how candid and “spin free” this analysis really is about our energy future. No whining about global warming, no industrial policy tilt toward renewable energy or casting aspersions at coal for the sin of being fossil. American is importing less and producing more of its own energy needs. Strong growth in unconventional oil and natural gas production from shale is dramatically increasing America’s energy supply options and reducing America’s reliance on oil and other imported liquid fuel. Growth in unconventional oil and natural gas production is a BIG DEAL. Domestic production of oil and gas from unconventional sources (shale) grew at an average annual rate of 17% between 2000 and 2006. The number of active plays is expanding and the estimates of potential reserves is also growing not only in traditional producing areas like the Barnett Shale in Texas but in Bakken in North Dakota, Niobrara Shale in Colorado and the Plains and the Marcellus and Utica Shale in the East and MidAtlantic states. Shale gas production using horizontal drilling and hydraulic fracturing to unlock the potential of previously uneconomic supply is proving to be an equal opportunity blessing for many markets across America and around the world with an average annual growth rate of 48 percent over the 2006-2010 period. The AEO 2011 report says shale gas production will grow almost 4X from 2009 to 2035 to 12.2 trillion cubic feet in 2035 or 47% of total U.S. production up from the 16% share in 2009 (Figure 2). 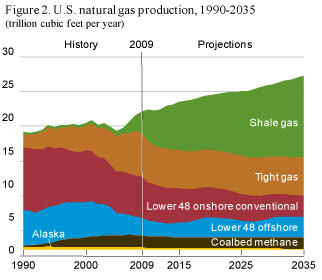 While total domestic natural gas production grows from 21.0 trillion cubic feet in 2009 to 26.3 trillion cubic feet in 2035. 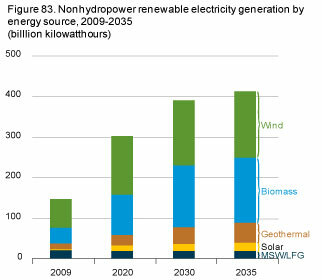 Renewable energy production grows by 72 percent from 11% market share in 2009 to 14% in 2035. Most of the growth in renewable energy is from wind and biomass facilities (Figure 3) driven by State renewable portfolio standard (RPS) mandates and Federal loan guarantees and incentives. Biomass growth results from dedicated biomass plants and co-firing in coal plants and is also driven by State RPS programs, low-cost feedstocks, and the Federal renewable fuels standard, and significant cogeneration of electricity at plants producing biofuels. The reality subtly stated in AEO2011 is despite the good and spectacular growth in renewable energy from wind, solar and other technologies—it just isn’t sufficient to make much of a dent in the overall market share of coal. The other reality is the low relative price of natural gas is putting enormous pressure on renewable energy to bring down its cost structure to match gas fired generation at “grid parity”. 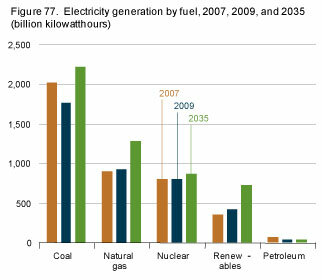 Coal-fired generation increases by 25% from 2009 to 2035, by improving efficiency of existing plants. But even faster growth in generation in natural gas and renewable energy will only reduce coal market share of total generation from 45% to 43% over the same period. 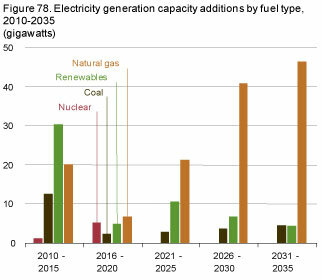 While utilities with substantial coal fired generation wait for US EPA to decide how far to push new regulations on existing coal power plants—the fast looming 2012 election cycle is likely to delay the answer. So what do utilities do? The lesson from an earlier time when coal plants were divested by utilities only to be bought by merchant energy investors, upgraded with scrubbers and more efficient technology was that coal plants still have a substantial useful life. In Putting Competitive Power Markets to the Test (2005) a study done for the Electric Power Supply Association during my time as President, Ventyx Energy Advisors division we assessed what happened as utilities divested power generation in exchange for stranded cost recovery. We tracked the transition performance of those power plants comparing before and after results for an independent analysis of the impact of wholesale competition across regional markets. Our work was presented at a NARUC conference of state regulators, included in testimony before FERC’s Electric Energy Markets Competition Task Force in Docket No. AD05-17-000 and cited by Congress as independent validation that wholesale power competition delivered cost effective benefits to consumers. The result of our analysis was that the efficiency gain by improving the performance and technology of these dirty old dog coal fired power plants was the function equivalent of energy savings sufficient to meet the electricity requirement for 25 million households for one year! Think about that for a minute! We can do much better than many utilities were doing to operate our existing fleet of coal fired power plants more efficiently by adding new technology and upgrading equipment BUT the government so regulates and penalizes utilities for doing so that it effectively discourages cleaning up the old plants and then bashes the utilities for failing to do so. And state regulators often fail to allow the utility to improve its rate of return by operating more efficiently by capturing any fuel savings and passing then entirely to customers. Thus utilities get complacent. The morale of the story is wholesale competition works to improve efficiency and performance across markets—let it happen! We don’t need more EPA regulations on coal plants. Actually, we need FEWER EPA regulations by reducing or eliminating those regulations like new source review that interfere with the continuous improvement and upgrade of existing plants by subjecting the plant to onerous new requirements, costs and environmental review process. Since these rules are like ‘volunteering to get your throat slashed’ it is no wonder many utility executives in the Midwest are considering retiring coal plants before the end of their useful life. The sum of all solar generation capacity installed worldwide today is about 15 GW, but the estimates of expected coal plant retirements in the Midwest ISO from new emissions regulations is 11 GW alone. The utilities will almost certainly ask regulators for recovery on the un-depreciated value (stranded cost) of their coal plant investment as these plants are retired. Then there will be replacement cost of that lost power generation with new plants. Who do you think will have to pay the sum of these feared costs? How much will this cost? Natural gas growth in power generation is due to low gas prices and relatively low capital construction costs that make it more attractive than coal. The share of generation from natural gas increases from 23 percent in 2009 to 25 percent in 2035. By happy coincidence natural gas prices are low because of the growth in domestic supplies of gas from unconventional production. At the same time, during the last boom in the electric power business cycle natural gas was the fuel of choice for new power plant construction. We built a lot of gas fired plants many of which are underutilized today as demand fell during the recession. That market share growth is a given as low prices mean gas plants become very economic choices for meeting future power needs. Greenhouse gas emissions grow slowly along with the recovery but do not reach 2005 levels until 2027. Emissions fell 3% in 2008 and 7% in 2009 caused by the recession. AEO 2011 projects slow growth in emissions due to slow economic growth and increasing use of renewable technology and fuels, better efficiency, and expanding use of less carbon-intensive natural gas. In the Reference case, which assumes no explicit regulations to limit GHG emissions beyond vehicle GHG standards, energy-related CO2 emissions do not return to 2005 levels (5,996 million metric tons) until 2027, growing by an average of 0.6% per year from 2009 to 2027, or a total of 10.6%. CO2 emissions then rise by an additional 5 percent from 2027 to 2035, to 6,311 million metric tons in 2035 (Figure 4). I suspect Al Gore and the USEPA will not like reading AEO2011. It suggest that the market is doing a credible job of slowing shifting the mix of fuel in our energy portfolio away from coal toward cleaner natural gas and renewable energy sources. No cap and trade nor onerous EPA regulations appear to be needed to maintain this transition to a cleaner energy economy. The second lesson is domestic production of oil and gas is a HUGE benefit to America’s economic competitive and recovery as well as to the transition to that cleaner energy economy. The third lesson is America is doing its part to manage and control the growth in greenhouse gas emissions and nothing we do will alter the actions of other nations—so let’s not spend ourselves into bankruptcy trying to do so. I know the government hates to hear the message that we are doing just fine, thank you, and the best way you can help is stay out of our way—but that appears to be the major lesson in this AEO2011 reference case. This entry was posted in Electric Power, Environment and tagged AEO2011, Annual Energy Outlook, biofuels, biomass, coal, Energy Information Administration, natural gas, renewable energy, solar energy, United States Environmental Protection Agency, wind. Bookmark the permalink.